The Dolan Technology Center (DTC) offers external customers many of the same services provided to the AEP system including a wide range of real-world testing services for electrical and mechanical equipment and systems. We can provide these services at your location or at our lab located on our 23-acre campus in Groveport, Ohio. 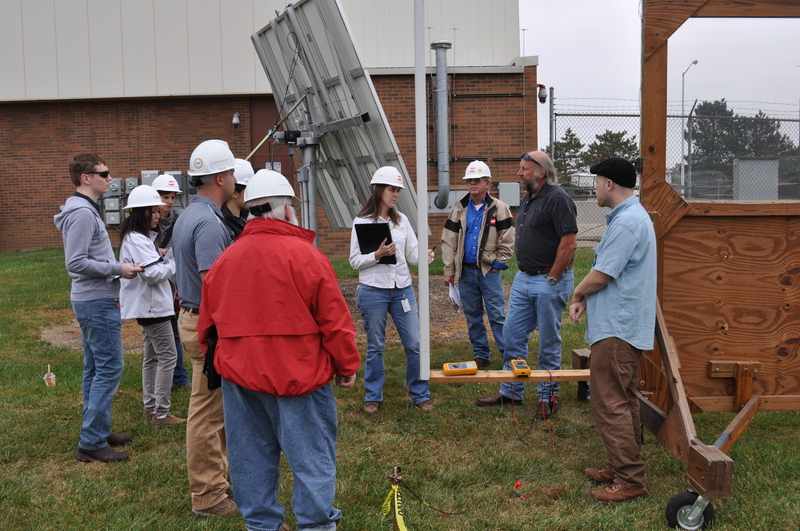 Dolan Technology Center (DTC) staff hosted field day activities for more than 50 AEP Transmission system engineers as part of the Red Book workshop presented by the Electric Power Research Institute (EPRI). The Red Book workshop included classroom lectures, field demonstrations, and applet tutorials encompassing all topics within the EPRI 3rd Edition Red Book. The Red Book is a complete reference manual covering the collective knowledge required to engineer EHV overhead transmission systems. “The workshop helps our engineers foresee, define, and solve problems or identify problems and seek the experts to help them address problems prior to them occurring in the field,” said Eric Engdahl, staff engineer –AEP Transmission. The workshop benefits the company by providing civil engineers with awareness and knowledge of the broader scope of the transmission systems they are working on and is intended to extend their skills beyond their specific engineering discipline. Field day activities allowed participants to gain hands-on experience of what they learned in the classroom by moving through five different stations: Outdoor Corona, Indoor Corona, Vehicle and Gutter/Downspout Induction, Midspan Electric & Magnetic Profiles, Perception, Space Potential, Shielding, and applet tutorials. Members of the EPRI team and DTC staff co-led the demonstrations. Wantland echoed that sentiment. “To know that Dolan is an AEP facility and can provide this type of testing is very impressive,” she said. EPRI Red Book workshop students experience and measure the effects of the electric field present in the vicinity of the double circuit 345 kV transmission line that crosses the rear of Dolan Lab. In the picture, the students use an electric field strength meter to measure the electric field at various distances from the center of the right-of-way ensuring consistent measurement from the same height above ground. 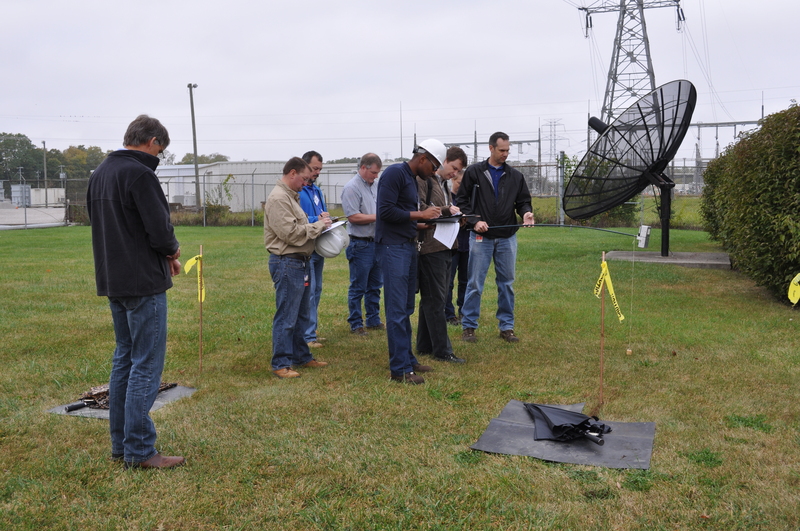 Attendees also used insulated mats, umbrellas, and copper ground rods to experience the effects of bringing their bodies to various potentials based on the distance from the transmission line. In short, they had the experience of being shocked. 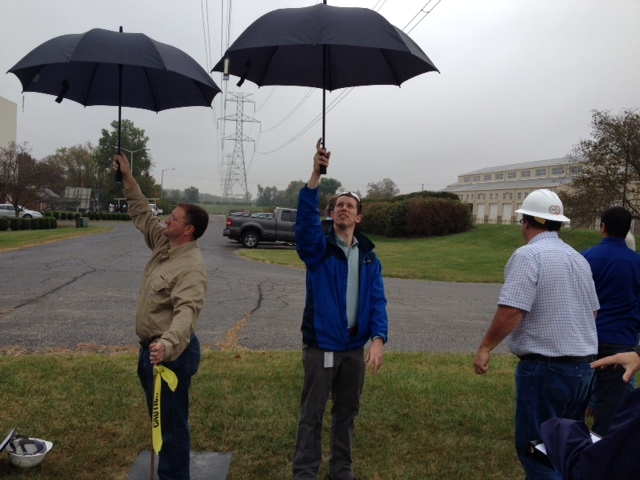 Chris Engelbrecht (far left) is the EPRI lead for this demonstration. Students measure both the magnetic and electric field effects on a simulated gutter/downspout. Various configurations were used to determine the effects of having metal objects and/or structures in close proximity to, in this case, a 345 kV double circuit transmission line. Students we able to move the wheeled structure to different locations and orientations to induce various levels of voltage and current depending on the distance and relationship of the structure to the transmission line right-of-way. Field demonstration leaders include (from right) EPRI representatives Justin Bell and Dr. John Kuffel. The top horizontal conductor is the static (or ground) line and the bottom horizontal conductor is being energized by the 1.2 MV Hipotronics Test Set. Installed between the top and bottom conductors are four different insulators in different configurations. Included in this set up are a string of porcelain disc insulators and three non-ceramic (or polymer) insulators. Note the polymer insulator at the far left has corona rings installed, while the two on the right do not. Also, the polymer insulator at the far right has standard line-end hardware installed on it (there are bolt ends that are slightly protruding downward), while the other three insulators have corona-free hardware. 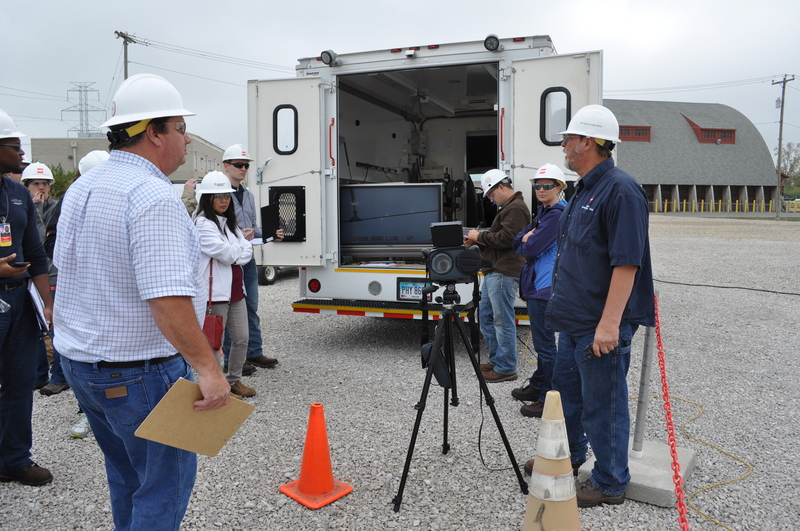 Through the use of the DayCor camera, this portion of the demonstration allowed participants the opportunity to see why corona-free hardware is required for transmission lines that are above 138 kV. A tripod (in the lower portion of the photo) holds a sound level meter to measure the audible noise generated by the corona on the test line and insulators. 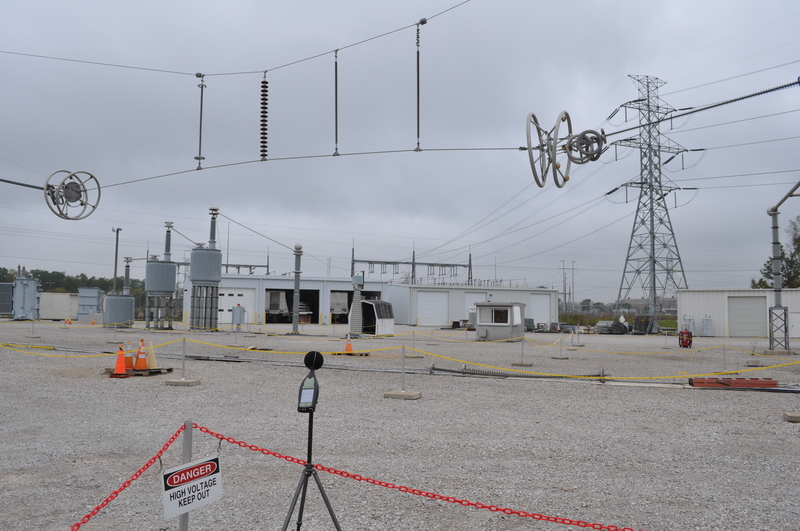 The test line voltage was raised—from 200 kV to 500 kV—to allow measurements of the audible noise created by corona activity at different voltages. 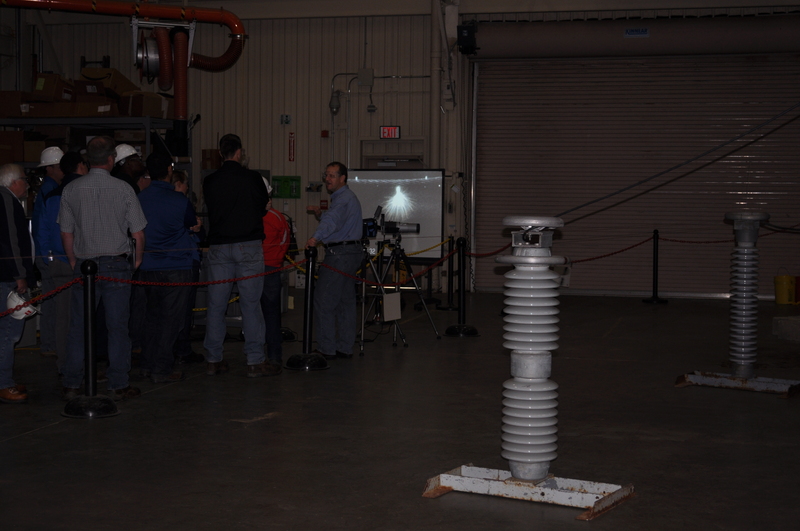 Participants watch a demonstration of the DayCor camera used to measure corona on a transmission line energized by the DTC 1.2 MV Hipotronics Test Set. The camera’s output is displayed on a plasma TV placed at the rear of the DTC test van. As can be observed in the camera’s output, corona is generated at several points along the test line and on the insulator that was deliberately installed without its corona ring to illustrate the need for this important piece of hardware. The DayCor camera provides a normal video image superimposed with an image that displays a software generated representation of the ultraviolet signature produced by the corona photons. Inside the DTC High Bay Dr. Andrew Phillips (right) of the EPRI team conducts an indoor corona test. In the center of this photo the corona camera output is projected onto a screen. The camera (used only in light-controlled or dark settings) displays the actual visual corona phenomena through the use of light amplifying techniques similar to those used on night vision equipment. The insulators in this image support various wire configurations to show the differential in corona generated as it relates to conductor construction geometry as well as size. Use of this site constitutes acceptance of the AEP Terms and Conditions. ©1996-2016 American Electric Power. All Rights Reserved.